Harare - Warriors striker Knowledge Musona was diagnosed with chicken pox, and will be out action for a few weeks. Musona joined Belgian minnows KSC Lokeren on loan from Anderlecht during the current January transfer window, and played the full 90 minutes in his debut last week, where the team lost 4-1 to AS Eupen. Lokeren manager Glen de Boeck told Belgian publication Walfoot of the latest news. 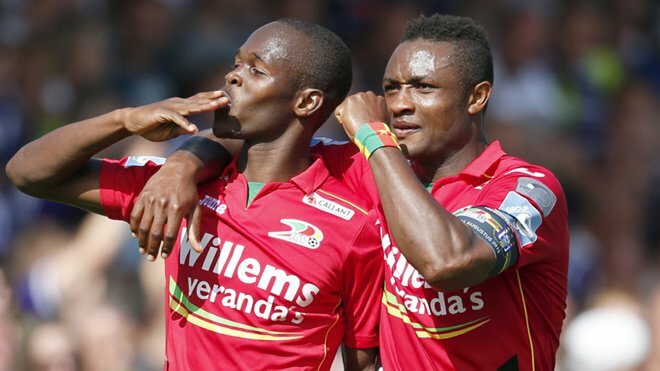 Reports from Belgium indicate that Lokeren, who anchor the log standings with 14 points from 24 games, paid a loan fee of around €500 000 for Musona’s move, which will run until June 30. Warriors coach Sunday Chidzambga’s hopes of using some of the England-born Zimbabwean players for the decisive Africa Cup of Nations (Afcon) qualifier could fail. The British brigade, as they are called are yet to secure Zimbabwean passports. Chidzambga has publicly stated his desire to have the likes of Macauley Bonne, Andy Rinomhota, Adam Chicksen and Kelly Lunga. The players — all born in England — need to be naturalised so that they could feature for Zimbabwe against Congo Brazzaville on March 24 at the National Sports Stadium.